Toyota has revealed the 12th-generation Toyota Corolla sedan, bringing with it similar updates announced with the arrival of the hatchback earlier this year. Now based on the same Toyota New Global Architecture (TNGA) body structure as the 5-door, the Corolla sedan will also share the hatchback’s new, more powerful 2.0-L gasoline engine, with a hybrid version set to be announced at the 2018 Los Angeles Auto Show. 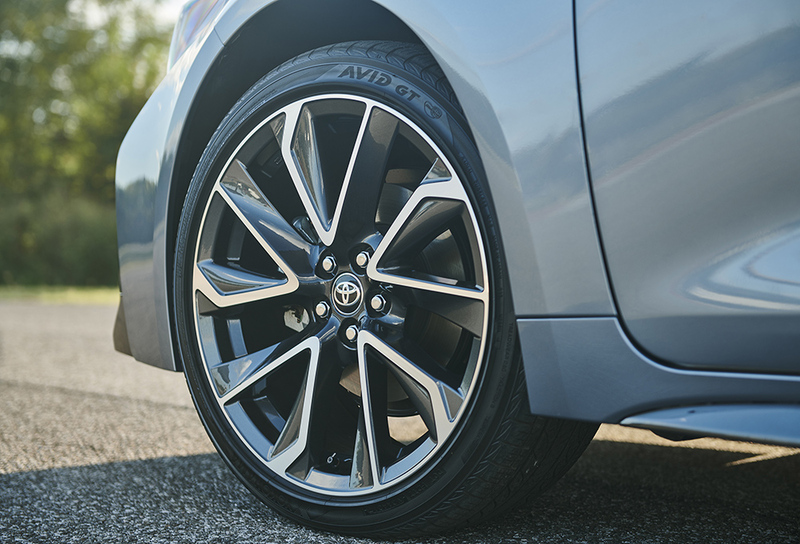 The Corolla’s new TNGA foundation is fortified with ultra-high-strength steel as well as new structural adhesives and sees torsional rigidity increase by 60%. Other mods include high-strength steel in the rocker-panel reinforcements and upper kick panel, wider underbody side members, thicker dashboard/floor panels and underbody tunnel along with a reinforced door-ring structure and larger-diameter impact beams for the front and rear doors. Even with the stiffer chassis, Toyota claims overall vehicle weight has been reduced. The MacPherson-strut front suspension, totally revised for this platform, uses a strut bearing mounted coaxially with the kingpin axis for smoother articulation. An all-new multi-link rear suspension replaces the torsion-beam setup used in the previous model, and new dampers are part of the redesign that sees suspension friction reduced by 40 percent. The new platform uses the same 106.3-in wheelbase as its predecessor but with a marginally wider track (+0.47/+0.87-in front/rear), and vehicle height is reduced 0.8 in. Front overhang has been clipped 1.3 in, and 18-inch wheels will be available for the first time. The chassis mods position the driver’s hip point 0.98-in lower and 1.57-in further rearward, and compared to the previous Corolla sedan, the instrument panel, cowl and beltline are all lower along with the hood, which drops 1.4-in thanks to a new engine-mount setup. These changes combined with slimmer A-pillars and repositioned side mirrors should improve outward visibility, and the new sedan’s cg drops by 0.39 in. The 2020 Corolla sedan in L, LE, and XLE trims will use the same (2ZR-FAE) 1.8-L gasoline engine found in the previous-gen Eco trim, and will produce 139 hp (104 kW) and 126 lb·ft (170 N·m) but with improved fuel economy. The XSE and SE grades are powered by the new M20A-FKS direct-injected 2.0-L inline 4-cylinder engine. The new mill sports a 13.0:1 compression ratio, direct and port fuel injection, variable valve timing (electrically controlled on the intake side) and a two-port oil pump and electric water pump that help yield a claimed thermal efficiency of 40%, 169 hp (126 kW) at 6,600 rpm and 151 lb·ft (205 N·m) at 4,800 rpm. The two 4-cylinder engines are paired with a new Dynamic-Shift CVT tuned to provide the feel of a traditional automatic by using a physical first gear for launch, before handing off to the CVT’s pulley system via a multi-plate wet clutch. Because the launch gear manages the higher input loads at launch, Toyota claims the size of the CVT’s belt and pulley components could be reduced and shifting speeds are 20% faster than in a conventional CVT. In Sport mode, the CVT will simulate 10 sequential gears, and the system is programmed to correlate increasing engine rpm and vehicle speed to provide a linear acceleration feel. Rare these days is an all-new 6-speed manual transmission with rev-matching control and standard hill-start assist, which will be optional on the SE trim. 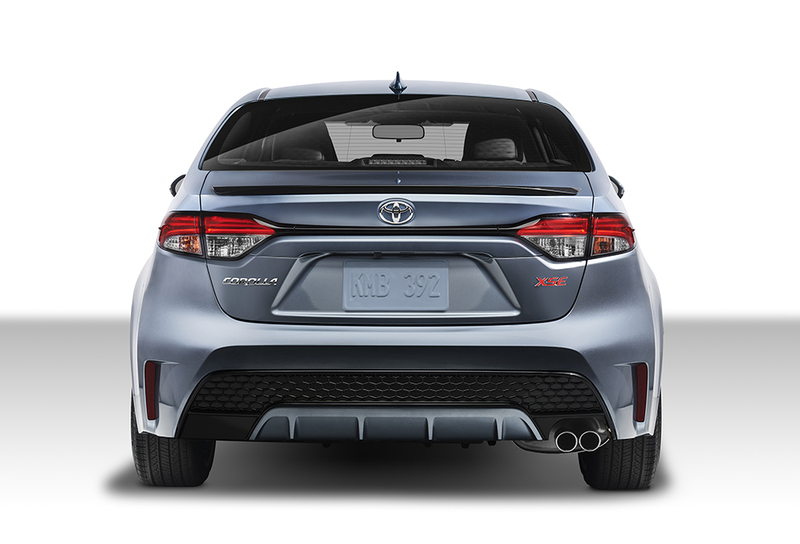 In the sheetmetal, particularly in the higher trims, the 2020 Corolla has a distinctly premium vibe, and will see widespread implementation of sound-absorbing materials (sealants, foams and Thinsulate insulation), with thicker inner- and outer-dash silencers, and a single-piece floor silencer pad. All 2020 Corolla sedan models use LED lighting, with available adaptive headlamps providing a wider light field by angling the low beam in the direction of the turn depending on steering angle and vehicle speed. Base models sport a 7-inch multimedia touchscreen, with all other trims outfitted with an 8-inch screen and Apple CarPlay/Amazon Alexa compatibility (but not Android Auto). 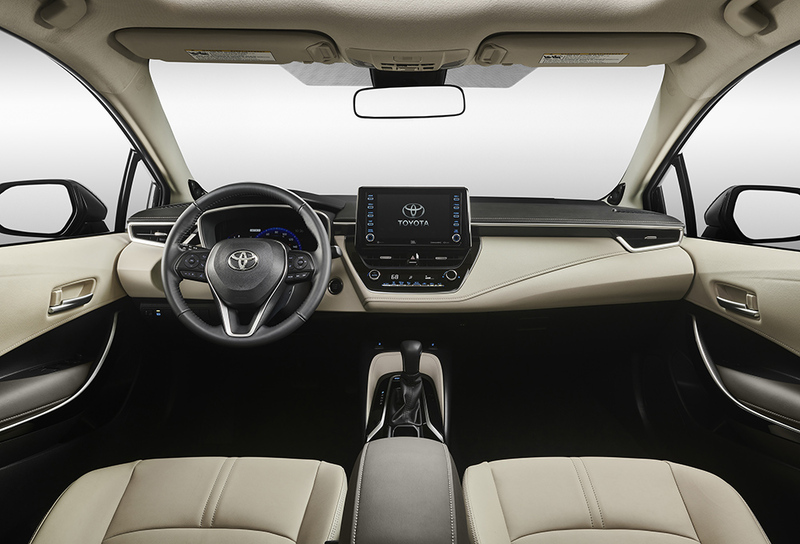 Discrete climate controls are located below the screens, and the console tray can house an optional Qi wireless charging pad. An innovative climate-control feature is a twin-layer recirculation/fresh-air induction unit that automatically sends dehumidified fresh air to the upper cabin to reduce glass fogging while recirculating warm cabin air in lower areas. The 2020 Corolla will feature eight standard airbags and an advanced suite of active safety features including lane-centering/departure assist and a radar- and camera-based auto-braking pre-collision system that provides pedestrian and cyclist detection under certain conditions. On CVT-equipped models, the adaptive cruise control system is capable of low-speed follow, including stop-and-go traffic. The new sedan’s connected-vehicle offerings include automatic emergency-services notification (based on airbag deployment), a manual SOS button and a stolen-vehicle locator. Remote functionality via the available smartphone app includes remote door lock/unlock and engine start, and a Verizon-sourced 4G LTE Wi-Fi hotspot can provide data for up to five devices. The 2020 Toyota Corolla sedan will be manufactured in three locations (Takaoka, Japan; Blue Springs, Mississippi; Huntsville, Alabama), with vehicles expected in U.S. dealerships by March 2019. Pricing characterized as “very similar” to current offerings will be announced closer to launch.